Welcome to Hove Beach Croquet Club, a relaxed, informal little club in the most idyllic of settings. The club is run for anyone who would like to watch, learn or play croquet, as well as its members. Croquet arrived in England from Ireland in the 1850s. At the end of the 19th century, it was more popular than tennis. Tennis eventually came out on top, largely because of croquet’s unsavoury reputation. In America it became associated with gambling, drinking and philandering to such an extent that it was once banned in Boston as an immoral practice. Herbert Swope, the American newspaperman, on whose estate Groucho Marx and Dorothy Parker were said to have played with unsportsmanlike rivalry, said, “croquet gives release to all the mischief in you. It makes you want to do bad things… it is a great game”. As a club member you can play at any time and get fully involved in the life of the club. You can bring your friends, reserve a lawn for a private party and have full access to the deckchairs, gazebos, rugs, barbeque and equipment. Membership is £40 for individuals and £50 for couples and families. Complete this Membership Form and bring it along at any time. 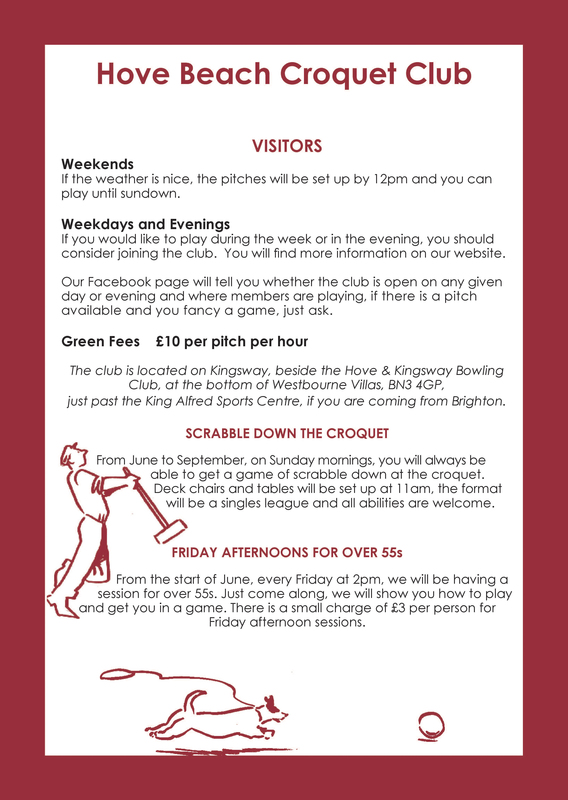 If you just want to play at weekends or on club evenings you could become a Friend of Hove Beach Croquet Club. For the small sum of £20 for individuals and £30 for couples and families you can play any weekend from May to October. Here is the Friends Form. Visitors who come along with members can play all day for £5, or £3 for a couple of games. All other visitors can pay for a pitch for an hour. The cost is £10 for the group, with all equipment included and a little coaching if necessary.